Six years ago I got a phone call in London with an Indian voice on the other side that said, “Hi Bob. Would you be available to come to Delhi to auction some hockey players?” I remember thinking someone is probably playing a prank so I said, “Sure, just drop me an email summarizing what you want”. To my surprise within 15 minutes I had a formal proposal in my inbox from the organizers of Hockey India League and three weeks later I was flying to India. It started from there. What do you think of the league format sporting events? I feel very fortunate to be able to witness this evolution of sports leagues in India. It is such a great innovation of the format of sports. It promotes Indian sportsmen and encourages young talent to shine through. It is nothing short of incredible how somebody aged 17 years was auctioned at $75000 in Hockey India league. Leagues have created immense opportunities and the potential is huge. Of the leagues you’ve worked with, which has been the most interesting? All of them pretty much follow the same format and I am expected to engineer and tailor-fit my role as per their requirements. They are all interesting in their own right and they all have their personalities. A lot of times people have an interest in different sports so you see the same people turn up as bidders. Therefore a lot of times you are working with similar variables but working with different organizers means you have a set of different challenges so you have to improvise and think on your feet. If you were a sponsor which of these leagues would you have invested in? While Hockey India League is the biggest, Pro Wrestling League is very promising based purely on its tremendous growth this season, Pro Kabaddi League is widely followed and also telecasted in London on Sky Sports. As a sponsor making a choice would totally depend on what my product was. They would all be a good vehicle for spending your money on. Besides, they are all my children, they all have their good qualities and I love them all dearly, I couldn’t possibly choose one. How different is the experience of auctioning in India versus in Europe? I feel Indian auctioneers are more relaxed. They take time and wait for people to make a bid and are not very pro active. My style is snappier. The idea is to make people sit up and join in. 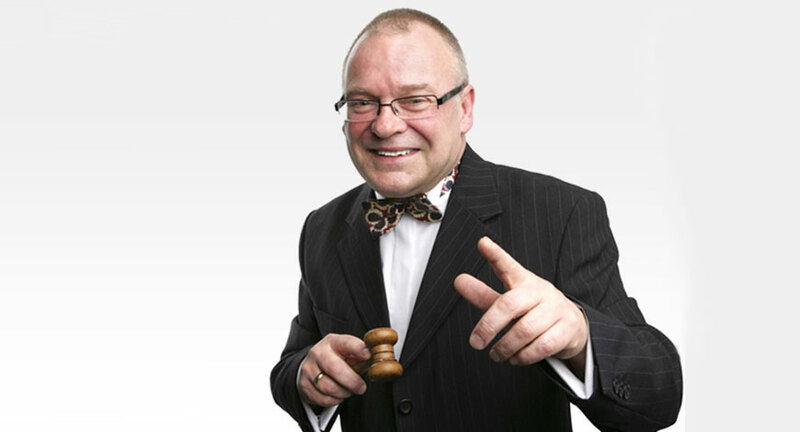 Auctions should be fun, with a serious intent of course. If someone is spending this kind of money, he deserves a bit of fun. Of the leagues you’ve worked with which has the most expensive players? I would have to say hockey. I think the highest bid has gone up to $130,000 in Hockey India League A Malaysian player in the Premier Badminton League was bid for a similar amount as well. Pricing varies and is negotiable. Depends on the event and what needs to be done. I and, my wife, Judith are a team, she gets all the paperwork done while I just get up there and shout and point at people. What is your long-term vision in India? I want to be the number one auctioneer in India.